In 1872 French author Jules Verne ensured that English gentleman Phileas Fogg made it from London’s Reform Club and back within the novel’s 80 day time limit. Using predominantly public forms of transport – anything from cargo ships to Indian trains – Fogg returned just after 8 pm on the 79th day of the challenge (though Fogg miscounted and thought he had lost the £20,000 bet by five minutes). 116 years later, Michael Palin and a BBC camera crew echoed Fogg’s fictional journey for real, watched by millions of people. Replicating Fogg’s use of public transport, and barred from using air travel (that didn’t exist in Verne’s time) Palin returned to London in 79 days just like Fogg. Very few people know that in between these two dates the trip through Europe, the Middle East, Asia, and the United States was first replicated for real in 1889. Nellie Bly (the pen name of Elizabeth Jane Cockrane) was an American journalist. 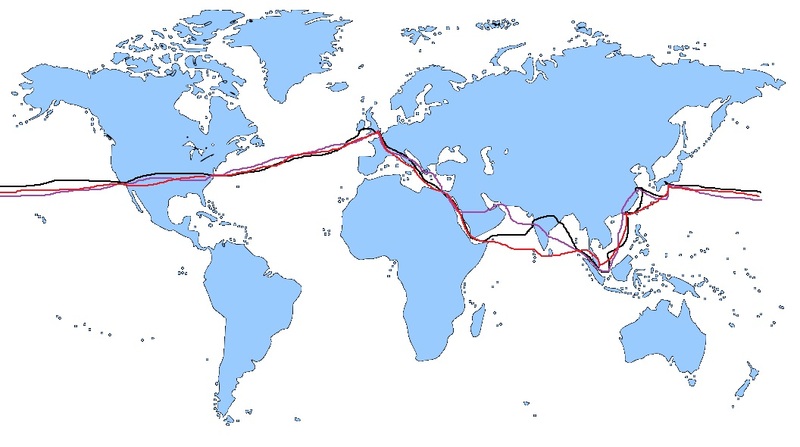 Unlike Fogg and Palin she began and ended her circumnavigation in New York, before crossing to London, Europe, and beyond. Advances in technology enabled her to send telegrams throughout her journey. Bly also used public forms of transport throughout, except on her return to the United States. Two days behind schedule due to weather conditions on the Pacific, a private train was hired for her by Pulitzer, owner of the newspaper she wrote for. But the private train wasn’t really a necessity, with Bly reaching her New York starting point in 72 days and six hours.